From going green to eating green, the colour green has been trending in recent years. 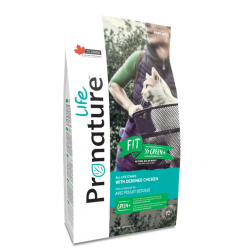 Pronature recently introduced their Life Fit>>Green+ dog and cat food that won Best New Product at our Expozoo show. We contacted Dominic Martel , Product Manager at Pronature to learn more about the product. 1. How long has Life Fit>>Green+ dog and cat food been on the market? Our Pronature Life line of products was launched in the beginning of 2018 and since then, it’s been a great year for the Fit>>Green+ recipe! More exciting new products are still to come in 2019. We believe that consumers will be more than happy to discover the brand extension. 2. 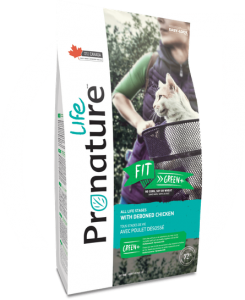 What was the inspiration behind Pronature Life Fit>>Green+ dog and cat food? First of all, with this product line, we wanted to target a new clientele: younger, “pet before kid” trend. We understand that the pet means everything in the everyday life of millennials. That’s why they seek a premium food, designed with simple ingredients meant to bring the best out of their pet. This Pronature Life line, formulated for all life stages & all breeds, has a recipe tailored to their lifestyle so they can focus on what’s important: spending quality time with their furry friend! #pronaturelife. To reach our targeted clientele, we chose a modern and trendy brand positioning: lifestyle look, social media oriented, compelling storytelling. Moreover, the creation of Pronature Life Fit>>Green+ product was inspired by this concept: Let’s be healthy together and eat life! 3. What makes Pronature Life Fit>>Green+ dog and cat food better than other food? Our Pronature Life Fit>>Green+ is a great quality product, at a competitive price, with intended attributes: fresh meat, no corn, soy or wheat, high level of animal protein, without artificial preservatives. It is also packed with superfood ingredients that are rich in vitamins and fiber. The Fit>>Green+ product helps cats and dogs of all life stages & all breeds maintain a slender waist and keep an active life! 4. What makes the food “Green”? KALE: In addition to meeting the pet’s needs in vitamins A, C, K and minerals, this super food has a high fiber content that provides a feeling of fullness and promotes better intestinal transit. Its low energy density helps maintain optimal weight. BROCCOLI: Low in calories but high in fiber, broccoli is an effective slimming ally that also facilitates digestion. Rich in vitamins B9 and C, as well as magnesium, it is known to have anticancer properties. SPINACH: Filled with vitamins B9, C, K and fiber, spinach is also a powerful antioxidant that provides a protective effect against cancer. Its capacity to provide a feeling of satiety, combined with its low caloric density, make it a key ingredient for weight control. 5. What do dog and cat owners have to say about the food? Pet owners are really engaged in social media and they often post about their dogs and cats. They take that opportunity to tell us about their experience with Pronature Life Fit>>Green+. We frequently receive positive comments about the good digestive health of their pets, the nice shiny coats and the great taste of the recipe. These 3 features are really important to us. Thanks to the high level of natural fibers, cats and dogs obtain good digestive health. De-boned chicken provides lots of protein and has a great taste pets love! We also added zinc (essential mineral) and fish oil (natural fatty acid with DHA) in the Pronature Life Fit>>Green+ recipe, to help cats and dogs maintain a nice shiny coat and lower hair loss. 6. Where can the food be purchased? You can easily find the Pronature Life Fit>>Green+ dog and cat food formula at most pet specialty retailers. You can visit our «Where to buy» page on the Pronature website to find a store near you. You can also access directly by clicking here. Congratulations to Pronature on their Best New Product win, and thank you to everyone who took the time to vote! Record Year for the Western Canadian Pet Industry Trade Show! Importance of Legal Counselling Within the Pet Industry There’s a reptile for everyone!